It’s a bit difficult to illustrate this post visually correctly but TheEye will give it a go. The main problem is the pure scale and impressiveness of the insult and how it doesn’t translate well in pictures. …this picture gives us context. It’s big. 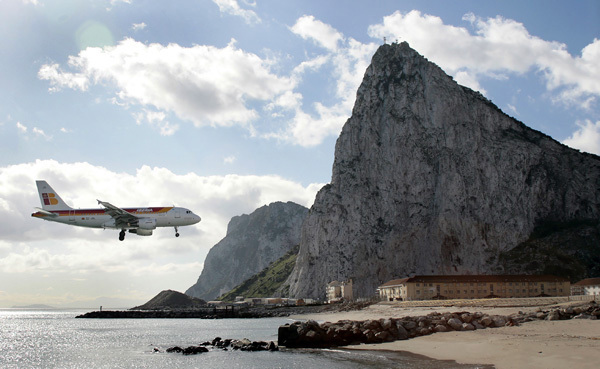 Gibraltar is a lot of geography in a small area. Look at the houses for scale. So what do we do for the Jubilee celebrations? That’s right. 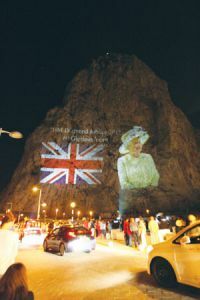 We set up a lightshow projecting a 17 million foot high* picture of the Queen on the Rock. The desired reaction was obtained. The Spanish have gone ballistic. They have dispatched King Juan Carlos (for it is he) down to the local fishing port of Algeciras next week to show “solidarity” with the local peasants in an obscure dispute over the size and shape of fishing nets. Lots of extra Spanish grumpiness in this video. Apologies for a couple of parochial post in a row but it’s great fun winding them up. They might be utterly financially doomed but the Spanish can spit a dummy with the best of them. * May contain traces of exaggeration. But not by much. Love it. Incidentally I had my retirement party in Gib. They make me laugh. They still have an enclave in Morocco…. haven’t heard a word of them giving that one back!